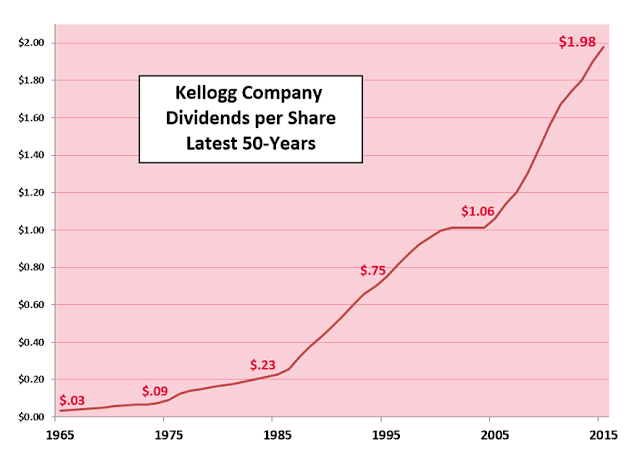 As you can see, a slow and steady business such as Kellogg Company has managed to reward its shareholders with more dividend income for decades. This is the type of business that is ignored by everyone else who wants to speculate in the glamour issues of the day. 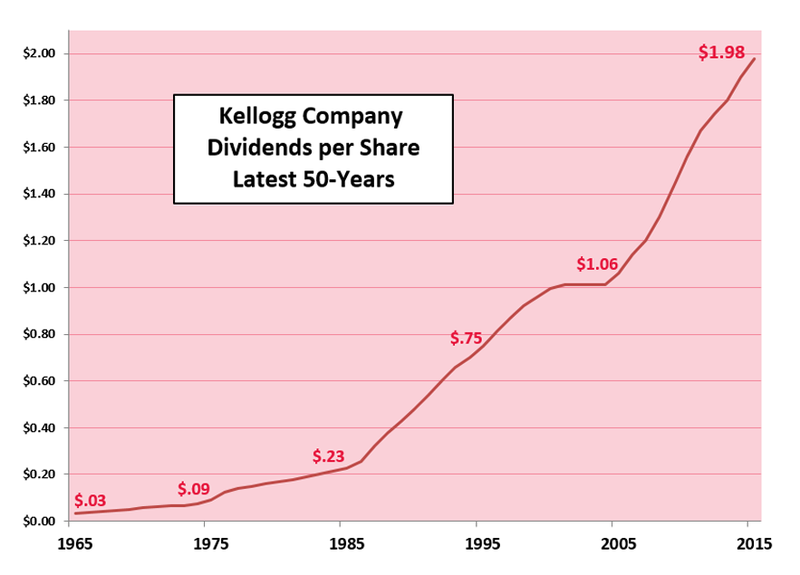 But the steady compounding has generated wealth to generations of stockholders of businesses like Kellogg. This type of investing works for patient long-term investors only however. International Flavors & Fragrances Inc. (IFF), together with its subsidiaries, creates, manufactures, and supplies flavors and fragrances for use in consumer products. It operates through two segments, Flavors and Fragrances. The company raised its quarterly dividend by 14.30% to 64 cents/share. This dividend achiever has raised distributions for 14 years in a row. The ten year average dividend growth rate is 10.60%/year . The stock is overvalued at 24.30 times expected earnings and yields 1.90%. I have meant to analyze this quality company in more detail, but unfortunately it has almost always been overvalued to merit initiating a position in. I would be interested in the company on dips below $110/share. Aqua America, Inc. (WTR), through its subsidiaries, operates regulated utilities that provide water or wastewater services in the United States. The company raised its quarterly dividend by 7.50% to 19.13 cents/share. This dividend champion has raised distributions for 25 years in a row. The ten year average dividend growth rate is 7.90%/year. The stock is overvalued at 24.90 times expected earnings and yields 2.30%. The stock would be attractively valued on dips below $27/share. Southside Bancshares, Inc. (SBSI) operates as a bank holding company for Southside Bank that provides a range of financial services to individuals, businesses, municipal entities, and nonprofit organizations. The company raised its quarterly dividend by 5% to 24 cents/share. This dividend achiever has raised distributions for 23years in a row. The ten year average dividend growth rate is 12.80%/year. The stock looks interesting at 18.20 times expected earnings and yields 3%. I need to add it to my list for further research. Carlisle Companies Incorporated (CSL) operates as a diversified manufacturing company in the United States and internationally. It operates through two segments, Flavors and Fragrances. The company raised its quarterly dividend by 16.70% to 35 cents/share. This dividend champion has raised distributions for 40 years in a row. The ten year average dividend growth rate is 8.60%/year. The stock is attractively valued at 15.70 times expected earnings and yields 1.30%. While the yield is low, and earnings growth hasn’t been stellar, I would need to revisit this company in a more detailed analysis. There was one company that announced a dividend cut last week. The company is Williams Companies (WMB). The Williams Companies, Inc. operates as an energy infrastructure company primarily in the United States. The company cut its quarterly dividend by 69% to 20 cents/share. The stock yields 3.10% right now. This ended the 12 year streak of annual dividend increases by Williams. I sold out of most of my Williams at the very beginning of 2016, as part of my process to reduce exposure to pass through entities. I kept a few shares in a retirement account, where the cost of selling would be prohibitive relative to the position size. If we study the history of Williams, we can see a cycle of booms and busts occurring frequently. The first one was in the late 1990s/early 2000s. The last one is today. I think that this company would do well for long-term shareholders, as it has entrepreneurial management that seeks ways to expand. Unfortunately, most of those expansion plans have tended to blow up on a couple of occasions, so that is on the other end of the spectrum of things to consider.